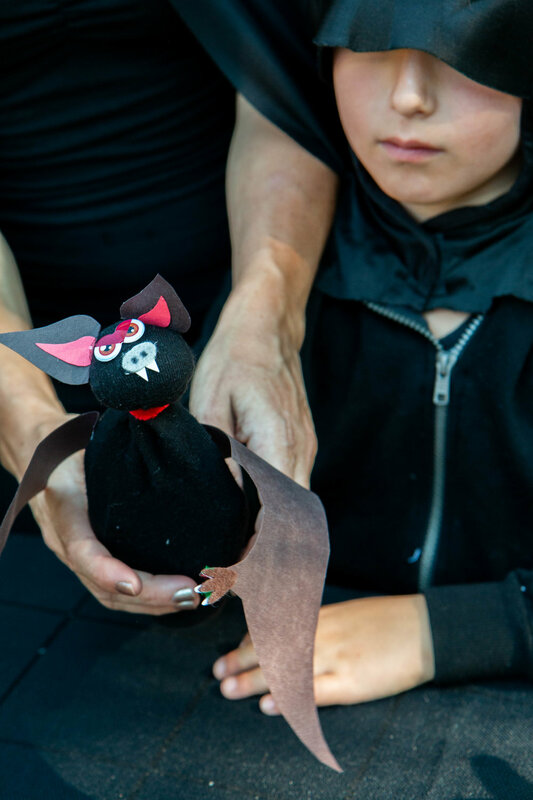 Trying to keep kids entertained at a Halloween party is made easy with these fun and interactive Bat Puppets! Seri’s Aunt Marissa is always thinking about amazing crafts to do with kids, and this one is such a winner. Not only do they have fun making it, but they can play with it afterward too! Step 1: Stuff your sock with a handful of polyester fiberfill, then use your hair tie to bunch it up to the top to create the head. 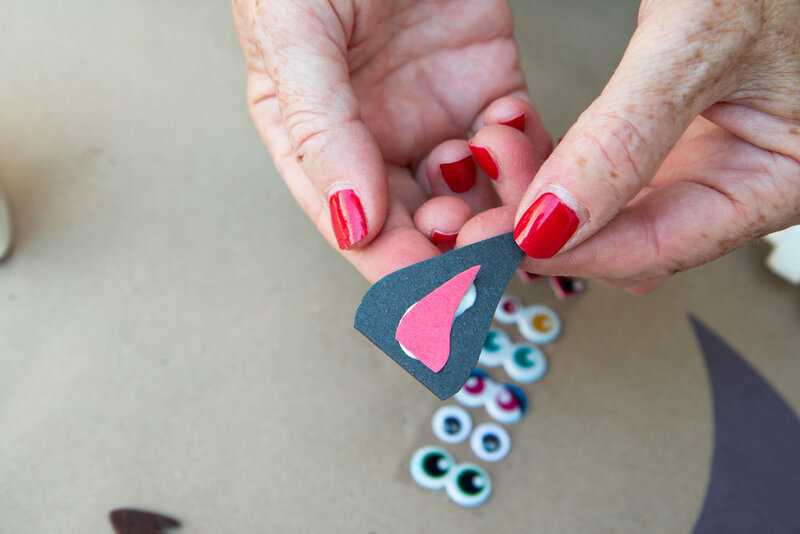 Step 2: Use regular glue to attach small triangular pieces of red construction paper onto triangular pieces of black construction paper, leaving a small flap on the black part to attach to the head. Step 3: Use the fabric glue on the flaps of the ears to attach to the head. Step 4: Stick on a pair of googly eyes. Step 5: Using regular glue, attach a round piece of gray felt to a piece of white construction paper to create the nose and teeth. Then attach this to the head with fabric glue. 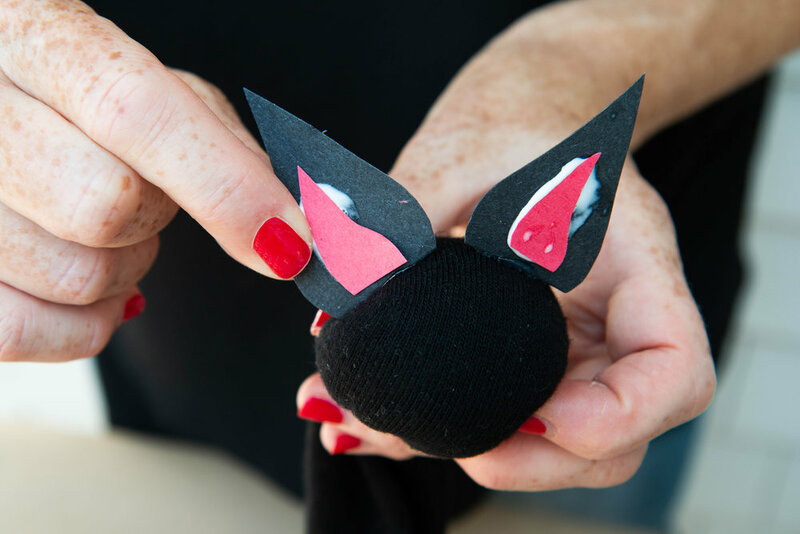 Step 6: Make a flap on your wings made of black construction paper and use fabric glue to attach to the body of the bat, below the head. Step 7: Use the gray felt to make little claws and attach to the ends of the wings. What a fun Halloween activity for kids, and looks so cute for your next party! Thanks again to Marissa for this brilliant idea. Happy crafting!